In East Africa there are about 200 species of snake. Most of them are harmless or very rare. Basically there are 6 poisonous snakes in Uganda that can be fatal. This is a strong and aggressive snake with an average length of 1 meter. It is mainly found on the ground, in different parts of Uganda (even in highly populated areas such as Kampala). It is very strong, but cannot lift the head from the ground. When it bites, it bites hard and low. Symptoms of a poisonous bite are heavy bleeding and destruction of tissue on the site of the bite. This is a slow and unaggressive snake with an average length of 125-155 centimeters. It is mainly found in forests and nearby grasslands. 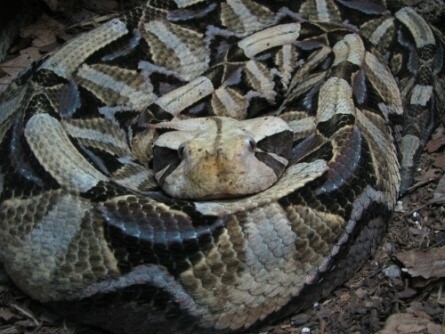 It rarely bites, but when it bites, the effects can be disastrous because Gaboon vipers produce the largest quantities of poison of any poisonous snake and they don’t release after a bite. Symptoms of a bite are similar to that of the puff adder. This is a shy, slender and quick green snake with an average length of 1.5 meters. They are rarely seen in Uganda, not typically aggressive and mostly found in trees. Symptoms of a poisonous bite are difficulties with speaking or other neurologic signs like loss of consciousness and trouble breathing. Just like the puff adder and the Gaboon viper it also gives destruction of tissue at the site of the bite. This is a slender and shy, but unpredictable and powerful snake with colors varying from grey to dark brown. The inside of the mouth is black, which is why it is called black mamba. In Uganda they are very rare (or maybe even non-existent). It is mainly found on the ground, but can also be found in trees. It has the ability to lift the head of the ground, so when it strikes, it bites at knee-height. The symptoms of a poisonous bite are similar to that of the Jameson’s mamba. This is the largest cobra, with lengths of 1.4 to 2.2 meters. It has a brown color and is a very good swimmer, so it is mainly found in and around water (but can also climb in high trees). It can lift its head quite high and strikes quickly (knee-height). The symptoms of a poisonous bite are similar to that of the mambas. This is a snake that is able to project poison at a possible threat . It is commonly found in Uganda, in particular near rivers and streams. It has the tendency to spit its poison with only the slightest provocation, but bites rarely. The poison is very irritating for the skin, but doesn’t kill humans. Bites of the spitting cobra give similar symptoms as the mambas and the forest cobra. What to do when you are bitten by a snake? Don’t panic! Try to squeeze the poison out of the hole and wipe it away in the first few seconds. Immobilize the affected limb (moving and sucking will make it worse). Don’t use a tourniquet to shut off the blood supply. Come to The Surgery as soon as possible so that we can give you specific antivenin as soon as you get the symptoms of toxic snake poisoning.